It’s reasonably safe to presume The Walking Dead has a lot riding on the back half of Season 7. The aging horror-drama is still a cash cow for AMC – one likely to endure for at least five more seasons – but took a significant critical bludgeoning for its uptick in violence and despair in Season 7. It’s enough that stars and producers have very vocally taken to presaging a more optimistic second half that better resembles the show fans fell in love with, all the while defending its darker stretch as Team Rick needing to reach a place of seeking justice against the Saviors; not revenge. As you can imagine, “Rock in the Road” can’t move much farther than square one on that front, but still manages to cover some impressive ground. Not only do we move from Hilltop to The Kingdom to an impressively tense scene defusing a Savior trap in the road (and mowing down a herd with a steel cable between two cars), but we even have time for the Saviors to visit Alexandria in search of Daryl, and venture out again to find yet another community caught up in this war. That unnamed group in particular seemed to bookend “Rock in the Road,” first circling back to Gabriel evidently* deciding to abandon Alexandria, and closing on Rick’s smile at the armed group surrounding them. I presume the odd reaction pertains to Rick realizing their new captors could represent the army they’d failed to recruit all hour, and in that sense, there was a certain optimism pervading the premiere. 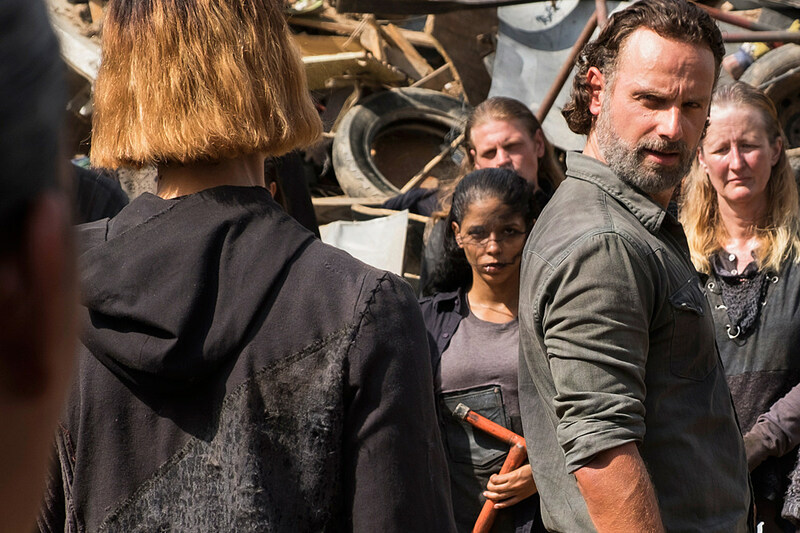 Gregory was his usual self-motivated cad, though Maggie seems to have the Hilltop’s support, and while Ezekiel ultimately opted against joining Rick’s rebellion, Daryl at least has a new safe haven. Faith and optimism are visible all across Andrew Lincoln; particularly in the title story of someone who believes good to be found in treacherous effort, and hope marks a memorable color for the series. Moments levity and wonder certainly help, as we saw with Rick’s group reacting to Shiva. *I presume we’ll revisit Gabriel’s perspective in the next few weeks to find that our mysterious boots-wearing figure forced him to loot the pantry and flee. That said, I’m at least a little confused who left the “BOAT” clue in the bible (if indeed Gabriel didn’t’ know of Rick and Aaron’s journey), or if these junkyard folk have anything to do with the survivalist who made that sign/trap in the first place. Understandably, “Rock in the Road” serves largely as a functional hour, prone to reminding us of what certain characters have been up to, who has or hasn’t yet learned of certain deaths, decisions to kill, and exactly how dead we should expect Ezekiel’s young Padawan (what, you think Carol will die to motivate him?). A few little bits like Sasha’s efforts to befriend Rosita, or Aaron and Eric’s uncertainty about the mission offer a spot of color to the characters that will prove invaluable once Season 7 regains its focus. It’s also probably worth mentioning that the premiere only tacitly checks in with Negan and the Saviors; perhaps best leaving their threat as an over-the-horizon menace to that tense bomb-defusal sequence, rather than their usual haggard-looking extras and leaning big bads. I don’t see Negan’s cartoonish villainy as a problem The Walking Dead can’t fix, but like the title “Rock in the Road,” I wonder if there isn’t value to uprooting it. Depending on what happened in that cold open … was Gabriel trying to read in the dark? “Let me stop you before you break into song.” I hereby quorum until we agree to a musical episode. Could not Morgan have at least said that Carol has a house nearby? Seriously, that Kingdom kid is deaddddddddddd. Intriguing interlude to feature The Kingdom’s one-armed and one-legged warriors ,though I hope it pays off down the line. Do I not remember Abraham and Sasha actually sleeping together? Poor Fat Joey. And/or regular Joey, now stripped of his qualifying trait. There’s no way Rick or Michonne should have survived that amount of walkers. That said, they should try the clothesline thing more often. The Walking Dead Season 7 will return February 19 with “New Best Friends,” airing at 9:00 P.M. on AMC.